When using the keyboard, if you tap the 123 button, and slide your finger (without lifting it) to any number or punctuation symbol, when you lift your finger the keyboard will return to the alphabetic keyboard automatically. One less tap! 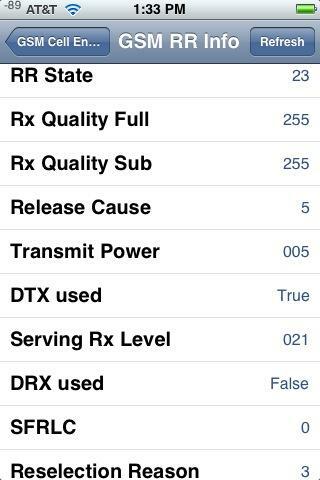 to bring up the spirit of iPhone's Field Test mode (this is different from the DFU mode familair to jailbreakers), which will give you information about towers and signal strength, 3G/EDGE network and much more info which no mortal would ever need. will display your IMEI. No need to tap Call. Check whether the connected line presentation is enabled or not. Determine if call waiting is enabled. Check the number for call forwarding if no service is available. Check for call control bars. originally submitted by GeneQ on Super User. Scenario: You are trying to take a picture of yourself (and perhaps a friend), so you have the phone turned around, and you cant seem to hit the "shutter" button to take a picture. Tip: Hold your finger on the "shutter" button, turn the phone around, and when you are ready to take a picture remove your finger. The picture will be taken when you remove your finger. This is much easier than the "old" approach. Special characters on the keyboard. originally submitted by Herb Caudill on Super User. Tapping the status bar will almost always bring you to the top of the scroll view. Go to Settings->General->Keyboard, and turn on Enable Caps Lock. When typing the shift key will still behave as before, but now you will have the option to double-tap it to turn on Caps-Lock (shift key will turn blue). Useful for acronyms, and shouting. originally submitted by jwaddell on Super User. Since the screen is multitouch, you can hold the Shift key while typing other keys to type them in uppercase (just like a real keyboard). Double tapping the space key ends a sentence by filling in a period. originally submitted by Sathya on Super User. If you hold your finger down on a link in Safari then you can open the linked page in a new "tab". originally submitted by John Topley on Super User. You can play videos even when the phone is locked. Sometimes I listen to video podcasts, where all I am interested in is the audio. When doing this, if you lock the phone the podcast stops playing. However, you can start the podcast playing again even with the phone locked. Just double press the home key to bring up the iPod controls and then press play. originally submitted by andynormancx on Super User. Everyone knows about pinch to zoom in/out on Google Maps. Many people know that they can double-tap to zoom in. Did you know that you can do two-finger-tap to zoom out? So useful when driving with iPhone mounted on dash. In 3.0, you can hold down the hyphen key on the keyboard to get an em dash character. Similarly hold down the period to get an ellipsis. You can also hold down keys such as "a" or "e" to get accented versions of those letters. Double clicking the home button in iOS4 shows a custom task bar with your recently used and still running multi-tasked apps. Click and hold to close them one by one. 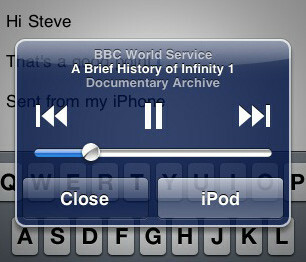 Also shows the iPod controls as before. In 3.0, you can adjust the scrubbing speed through a song by touching the scrubbing slider, then moving your finger down on the screen. Different distances from the scrubbing bar mean different (slower) scrubbing speeds. While it's not exactly private browsing, you can clear your Safari history, cookies, and cache from the Settings application in the Safari menu. The Home button (when pressed in the Springboard) by default will send you to the first screen of applications. However, if you press Home, wait for the first page of apps to be displayed, then press Home again, the Search screen will be presented. Subsequent presses will toggle back and forth between the first apps page and the Search page. (Note that you have to delay slightly between presses, otherwise the two-press shortcut will kick in and launch some other app (iPod by default)). originally submitted by Tim on Super User. In 3.0, when editing some text, shake the phone to get the option undo your edits. To redo your edits, just shake the phone again. I've just discovered that if you scroll to the top of the list of Contacts in the Phone app, your own phone number is listed above the search field. In the Mail application you can select the portion of text that you want to quote. Hit the Reply button and the selection will appear at the end of the email, instead of the whole original message. In the maps app you don't have to pinch to zoom in and out. Double tapping zooms in and tapping with two fingers zooms out. This makes it much easier when you are using the phone with one hand. You can double tap the shift to keep caps lock on. Tap just below the seek/scrub bar to hide/show it. originally submitted by e11world on Super User. You can listen to any audio that is being streamed through Quicktime in Safari (.mp3, .m3u, .pls etc files) in the background. Start the stream via a link in Safari.app, and then hit the home button and the audio will continue to play. This was very notable pre-iOS4, not sure if it worked pre iOS3 though. In Maps, you can switch to street view by dropping a pin, tapping it, and then tapping the little orange guy. If you have multiple phone numbers for people, you can say which phone number to call, 'call John Smith home', 'call Davey Jones mobile'. If the iPhone is locked, and you double press the Home button to bring up the iPod controls while playing a song, shaking the iPhone skips to the next song. single clicking the headphones remote button will pause the music. double clicking the headphones remote button will skip to the next song. triple clicking the headphones remote button will go back to the previous song. When the iPhone is locked you can still access the iPod back/play/pause/next track buttons by pressing the Home button twice - only discovered that the other day and completely by accident...! originally submitted by Mike McClelland on Super User. To quickly access your draft email messages, press and hold the new email button on the toolbar. A new dialog appears showing "New Message" and an option plus all of your draft emails. Starting from iOS4, while listening to music in iPod app the screen turns on for a second to show what song is currently playing. It won't happen if the iPhone is in your pocket. You can have more than the 11 screen limit for apps. If you add them, they won't be displayed, but will still be installed on the phone. You can still get to them by using a spotlight search for the app name and launch them, even though they're not visible. originally submitted by Mark Struzinski on Super User. Not the answer you're looking for? Browse other questions tagged iphone hidden-features . What are good sources for iPhone 4/iPad wallpapers? What does changing “my number” on the iPhone do? Has Apple hidden any tributes to Steve Jobs? What are the under-documented differences between iPhone 8, iPhone 8 Plus and iPhone X?